It’s time once more for my own London masterclasses. This Thursday and Friday, Feb 14 and 15, I’ll be teaching four young professional chamber groups (see my Concerts and Events page for details). We’ll be working on Beethoven (a piano trio and a cello/piano sonata), a Brahms trio, a Mozart piano quartet, and some Shostakovich. It’s free to come and listen to the sessions, as long as you register your name with Keturah Haisman beforehand. Just one clarification: we can’t provide lunch for listeners. Lunch is just for the participants. If you want to come to the final concert by my participants, at 6.15pm on Friday, tickets are £10 and include a glass of wine. I can thoroughly recommend this event, as all the musicians are in fact already successful young performers in their own right, and appear in many leading concert venues around Europe. Because of time restrictions on Friday evening, each group will probably play for around 20-25 minutes. In some cases, that means a whole work; in other cases, selected movements. You can come to the coaching sessions, or the sessions and the concert, or just to the concert if you like. Come and support these talented young performers and find out what it is that musicians talk about when we’re rehearsing and studying these wonderful chamber works. This entry was posted on Monday 11th February 2013 at 8:00am	and is filed under Concerts, Teaching. You can leave a response, or trackback from your own site. 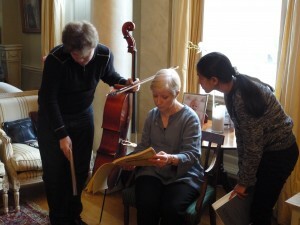 Wow, it sounds like a fantastic event for chamber music enthusiasts! I wish I was in London to enjoy it. I just stumbled upon this lovely little youtube clip and immediately thought you for some reason. Anyway, maybe you and your readers might enjoy it!